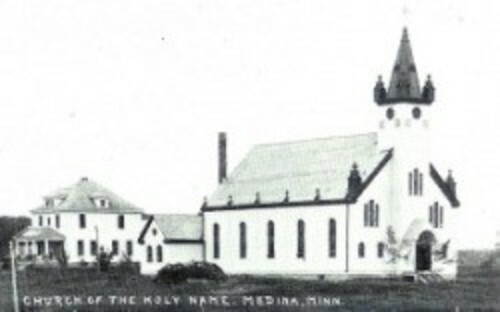 Holy Name of Jesus Catholic Community traces its history to 1856, when priests began traveling to Medina, Minnesota (bordering Wayzata today) to say Mass at the homes of residents in this area. After years of Masses and Baptisms taking place in the home, land was donated for building Holy Name of Jesus Parish, which was incorporated in 1864. Our Benedictine heritage began here, as the parish was administered by the Benedictine Order from St. Boniface Parish, Minneapolis (a parish staffed with priests by the St. John’s Abbey near St. Cloud). Later, in the early 1900s, St. John’s Abbey supplied priests for Holy Name of Jesus through June 2007. A frame church replaced the original log church in 1875, and the original church began to be used as a school. At this time, the school was only open for three months of the year. When the frame church was struck by lightning and burned in 1911, a new church was built and dedicated in 1913. This is the old white church that, while it has undergone much rebuilding and restoration, still stands on our grounds to this day. Over the years, the school was also rebuilt and renovated to accommodate the growing demand, and in September 1919, Holy Name of Jesus School opened its door for the full school year. This first year, 52 students were enrolled in all eight elementary grades and one year of high school, and students were taught by four nuns. Today, Holy Name of Jesus School serves 373 students in preschool through sixth grade . The Rev. Arnold Weber, O.S.B., came to Holy Name of Jesus on July 1, 1972. A retreat master, marriage counselor, a gifted public speaker, his sermons were a pleasure to hear. He left in June 1973 to administer Benilde St. Margaret High School but returned to Holy Name of Jesus in December 1980, while simultaneously retaining his position at Benilde-St. Margaret's. In June 1981, he was replaced at Benilde-St. Margaret's and became full time pastor at Holy Name of Jesus. The community of Holy Name of Jesus was blessed to have Father Arnold with us for 23 years. 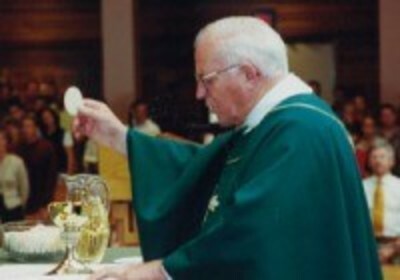 Father Arnold began immediately to build community at Holy Name of Jesus, to liven up the liturgies, to encourage stewardship, and to promote unity in all that was done in the parish. 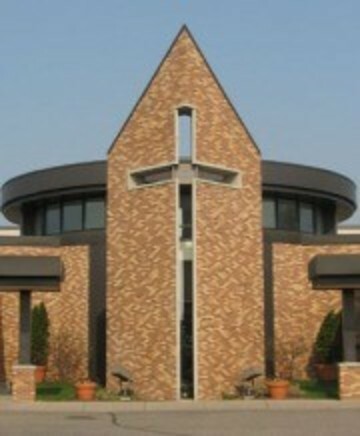 To accommodate our rapidly growing parish, in August 1983, construction was completed on a new gymnasium, new temporary Worship Center, library and additional classroom wing. The church we worship in today was dedicated November 22, 1987, and the temporary Worship Center was converted into the current Good Samaritan Center. In the early 2000s, parishioners were invited to share in the ministerial life of the community by participating in the newly formed Ministry Area Commissions. All the various ministries of Holy Name of Jesus were grouped under seven commission heads: Liturgy, Stewardship, Social Justice, Finance & Administration, Faith Formation, Pastoral Care, and School. The commission leaders met monthly to help foster all areas of ministry. Today, the work of Stewardship and Social Justice Commissions has been combined into our Parish Life Commission, while the other commissions have remained. Know the heart of Christ. Read our full Parish History.